I ran into my friend George at the health club, which he manages. He was hosting a Superbowl Party that evening in the club’s Vista Room for a few friends. The Vista Room has a giant screen TV and amazing 180′ views of Manhattan and the East River at Hell’s gate from the 38th floor. I was a last minute invitee, considering I’m not much of a sports fan, but am known to do good food.. “And could you please bring the chips?” asked George with a cute pleading look,…chips being code word for one of my food concoctions. Well, I couldn’t let those big strong boys go hungry. I didn’t have much time to fuss over a menu or preparation and I wanted the food to be portable. For me, even a paper plate affair should look inviting and exciting. My Tuna Sandwich Party Platter was just the ticket. A quick trip to the market would supplement what was already in my kitchen. Less than an hour of prep time was all I needed before kick-off. In a medium bowl, toss diced apples and capers in white wine vinegar to prevent browning. Mix in the tuna, mayonnaise, onion and relish, and combine well. Spread all of the bread slices with a thin coating of mayonnaise to act as both flavoring and glue. Arrange the lettuce over the bread so the curly edges match the crust edges. You will need to cut out the ribs of the lettuce and break the leaves a bit to achieve the look. Spread the tuna mixture evenly over the lettuce of 8 of the slices of bread. Arrange 4 medium tomato slices over each slice of tuna spread bread and place remaining slices of bread with lettuce over the tomatoes. Cut each sandwich diagonally into quarters with an electric or very sharp knife. Skewer a sandwich toothpick in the center of each triangle. 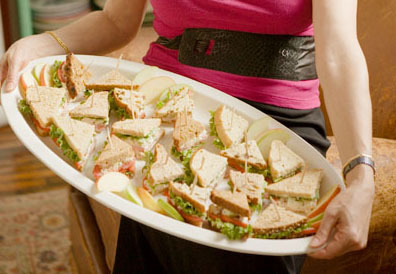 Arrange the sandwich pieces on a large platter alternating center points and crust ends outward. Dip the apple slices into lemon juice to prevent browning. Garnish platter with the apple slices. Serve with assorted chips, pickles, olives and beer, wine and soda. Make sure your knife is sharp when slicing tomatoes. Don’t use the end pieces. A large tomato yields about 6 slices. A medium tomato, about 4 slices. When purchasing pickles, olives and chips, mix different types and colors to make the side dishes interesting and beautiful. The phone rang as I rushed from the gym, still damp from head to toe. My thoughts raced as I answered….”Yes of course I can”…. manage to make lunch for an old client friend of mine. Joanne wanted me to meet her new Director boyfriend, and they were coming to my place. I had two and a half hours to shower, dress, shop, and prepare a light, beautiful and tasty meal. As I showered, I visualized something fast, easy, healthy and dazzling in a montage of images and flavors. I composed a solution for this lunch “affair”, my Tropical Mesclun Salad with Orange Poppy Seed Dressing. I added seafood to the recipe to make it a main course. 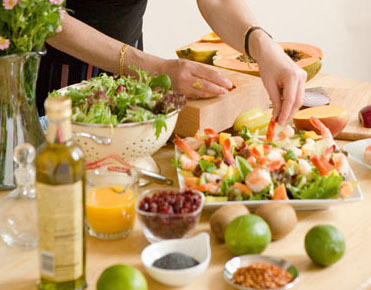 The seafood would harmonize well with the greens, fruit and citrus dressing. As I put on my jacket and gathered my purse, I calculated that I’d have forty-five minutes to get to the grocery store and back, and forty-five minutes to prepare the meal and dress the table. It would work. This recipe is more about buying quality produce and seafood and arranging it beautifully, rather than actual cooking. Wine glasses filled with sparkling water and slices of fresh lime add the finishing touch to the table. 1. Divide and arrange salad greens among 4 plates. Arrange the fruit over the greens alternating colors and textures. 2. In a small bowl, combine the orange juice, orange juice concentrate, shallot, crushed red pepper, poppy seeds and sea salt to taste. Whisk in the olive oil gradually until well combined. Taste and adjust the seasonings if necessary. Sserve the dressing on the side in a cruet or bowl with small ladle.